Home » Videos » Terrifying Car Bomb Blast Creates HUUUGE Double Shockwave. Damn! 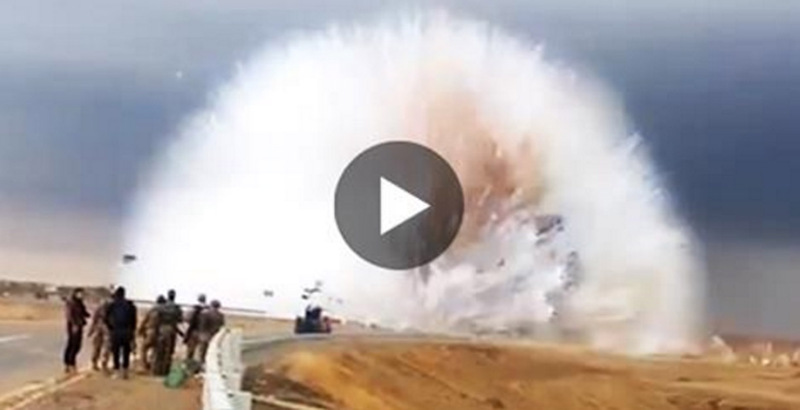 Terrifying Car Bomb Blast Creates HUUUGE Double Shockwave. Damn! Michael Bay is out there somewhere praising the masterpiece that is this video, I can just feel it in my bones. What you’re about to see is probably one of the largest car bomb explosions I’ve ever seen, hands down. Coming to us from Samarra, Iraq, the blast is so large it first creates the tell-tale visible explosion, but then the force of the shockwave makes a visible bubble in the air around it before it expands. The fact that people are resorting to sadistic tricks like this is ridiculously saddening. While this time everything seems to have turned out alright, it’s not that way every time. Especially on a day like today it’s important to remember those that have died in the sake of freedom, so Happy Memorial Day folks, now go out and enjoy it!